This cartoon is about the way that the use of smart phones encourages people to withdraw from the real world and to become totally immersed in their phones. 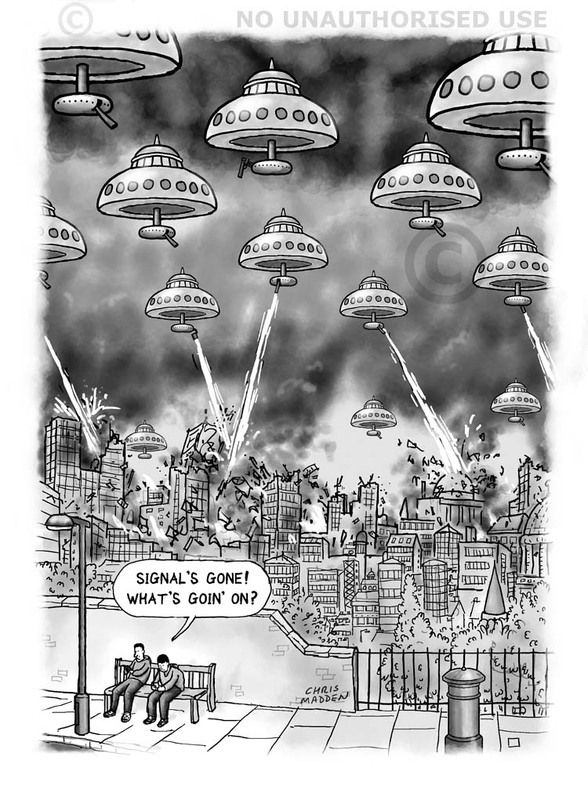 In the cartoon the two young people in the foreground are completely unaware that the city behind them is being destroyed by an alien invasion by flying saucers or ufos (and that this is the reason that their phones have lost their signal). The only thing that they notice is that the signal to their phones has gone. The cartoon is an illustration of the potential dangers of immersive technology. It was first published in Prospect magazine, April 2016. Extraterrestrial beings are just the same as us! In the cartoon the aliens have deduced that a human glove is a garment for the body and the (five) legs, while the shoe is an article of headgear like a hat. The aliens have reached their conclusion due to their bias towards their own body forms. This cartoon makes a very negative point about the human race. Personally I think that the human race is okay, but that we tend to have too high an expectation of ourselves and an unrealistic view of the possibility that we can attain an ideal state of existence. Cartoon – will the general public be able to travel in outer space? Cartoon – will members of the general public ever be able to travel in outer space? Here, in an imaginary setting in a fictitious world, the inhabitants are discovering that by removing the wheels from a cart the cart becomes really hard to move. They seem to be excited by this revelation. Quite why I’m not sure. In fact, I’m not really sure what the cartoon’s about at all. Perhaps it’s about the discovery of the significance of meaninglessness. This cartoon was drawn quite a few years ago, maybe in the 1980s. I must check. Part of the joke in this cartoon is that in many science fiction stories the aliens look very similar to people (and even speak English). I’ve retained the humanoid appearance here, but made one small alteration – I’ve put the features of the head upside down. One of the extraterrestrials in the cartoon is wearing a sci-fi tee shirt with the face of an alien on it. An image of an interstellar nebula shaped like a question mark – illustration created in Photoshop. The nebula symbolises humanity’s quest for meaning, especially when confronted by the enormity of the cosmos. (Having said that, my own opinion is that the size of the universe is irrelevant to such matters, but that’s another story). 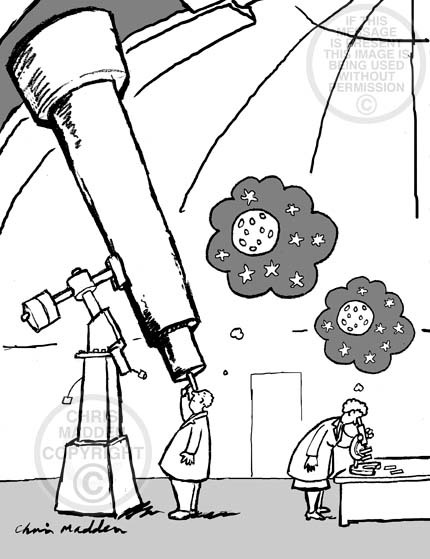 An illustration related to philosophy, astronomy, cosmology, science, the meaning of life, the nature of the universe. Hiding behind the sofa while watching Dr Who on tv. There is a cliche that children used to hide behind the sofa or settee when the daleks were on Dr Who. In this cartoon the roles are reversed, and it’s a young dalek that is hiding behind the sofa when Dr Who is on the television. 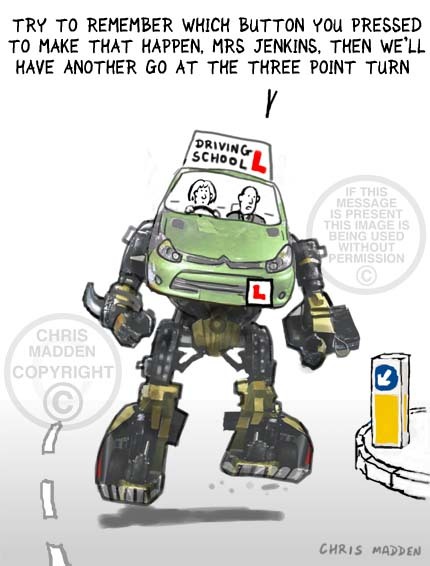 This dalek cartoon is based on a well known dalek cartoon by cartoonist Birkett that appeared in Punch in 1981. In the original cartoon the daleks were thwarted in their ambition to conquer the universe by a flight of steps or stairs, as daleks are famously of limited or restricted mobility (as they are basically motorised wheelchairs). In my updated version there is a wheelchair access ramp alongside the stairs, allowing them to now conquer the universe. When the original Birkett cartoon was drawn there weren’t as many wheelchair ramps or as much awareness of disabled access. 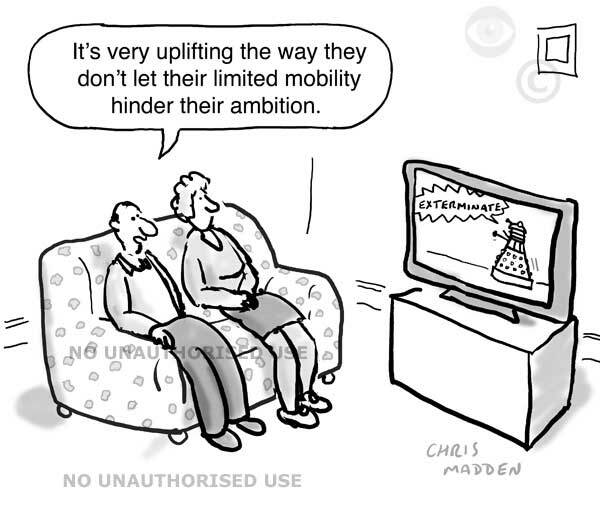 Part of the joke in this cartoon is that the daleks can now conquer the universe because of the well intentioned increase in handicapped or disabled access (an example of unintentional consequences). This week on tv the daleks were in Dr Who and the paralympics were taking place. The daleks famously have restricted mobility, as they are basically motorised wheelchairs. The paralympics show a positive approach to disability, so it seems right to point out that the daleks are a positive role model for the disabled too, as their limited mobility is no impediment to their attempts to conquer the universe. This week the daleks were in Dr Who and the paralympics were taking place. The daleks famously have restricted mobility, as they are basically motorised wheelchairs. So it’s a short step to imaging them taking part in the paralympics. The daleks are the main enemy of Dr Who. The name tardis is an acronym of Time And Relative Dimensions In Space. I remember that from the first episode (or was it the second) of the original series, which I saw when it was originally broadcast. I also remember that the tardis was meant to change shape whenever it landed on a new world so that it could camouflage itself, however it got stuck in the form of a police box due to a malfunction. Police boxes existed at the time of the first series (in the 1960s), but I think that they were going out of use even then. Did life come to earth from outer space? 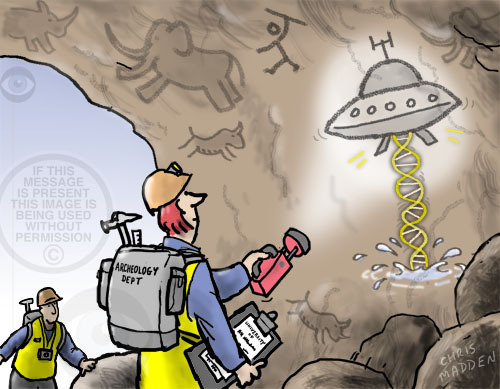 Illustration: did life come to earth from outer space? The concept that life was planted on earth by super-intelligent extraterrestrials, a concept known as directed panspermia (popularised by the question, Was God an Astronaut? as written about by Erich von Däniken, amongst others)has been revived recently with the film Prometheus by Ridley Scott, and will no doubt be aired again when the sequel is released. Did life reach earth from outer space? The ufo in the cartoon is projecting a dna shaped beam of energy down into the water on earth, creating the first life on the planet. The concept of Was God an Astronaut? (as written about by Erich von Däniken, amongst others)has been revived recently with the film Prometheus by Ridley Scott, and will no doubt be aired again when the sequel is released. In Prometheus there was a scene depicting prehistoric cave paintings, although not humorously as here. Illustration showing a robot thinking. The robot in the illustration is based on a toy tin robot. 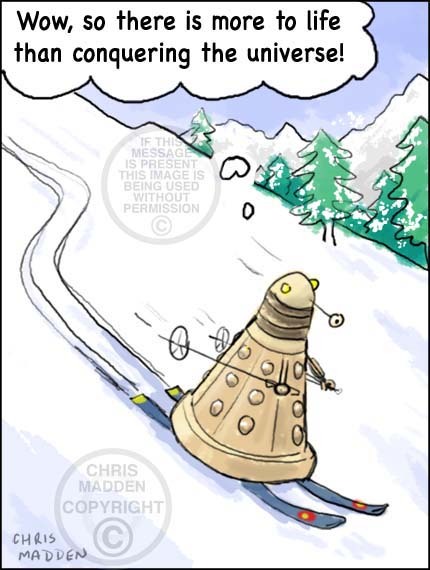 Dalek cartoon. Girl dalek who wants to grow up to be a ballerina. 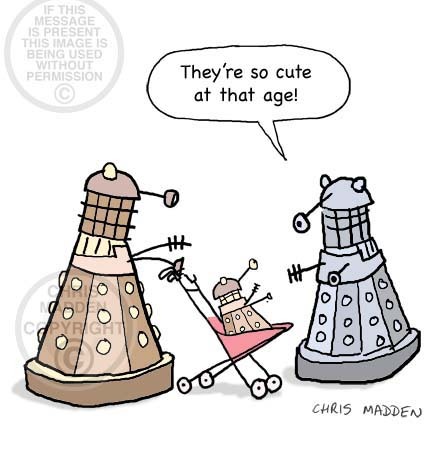 A cartoon showing a mother dalek and a little girl dalek. The little girl dalek wants to be a ballerina when she grows up, but her mother is trying to explain to her that daleks can’t become ballet dancers. A cartoon about ambition, dreams, delusion, parenting skills, gender stereotypes (the pink of the girl dalek, and the fact that she wants to be a ballerina), careers advice. The little girl dalek is ‘dressed’ in pink. Pink is the predominant fashion colour for young girls at the moment (2011) – it’s as though feminism never happened. Daleks, by the way, are evil aliens in the popular BBC tv series, Dr Who. You never see dalek children in the tv programme for some reason. 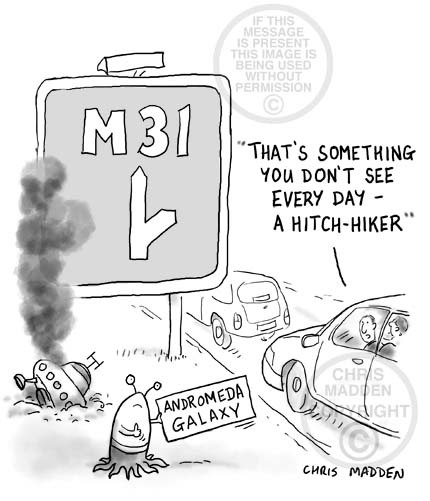 The cartoon also includes the joke that there could be a motorway or road called the M31, and M31 is also the name of the Andromeda Galaxy in the Messier catalogue. A cartoon to illustrate the fact that we as humans occupy a position in the scale of things that is part way between the really big and the really small, and that to a large extent both extremes are inaccessible to us.